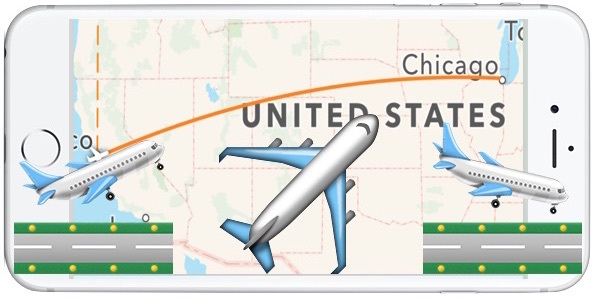 iOS has an excellent flight-lookup feature which allows users to instantly get flight information about planes that are coming and going. All you need to use this great ability is a flight number embedded somewhere, like a text message, email, note, or webpage, and the rest is just a matter of knowing how to retrieve the flight data from that flight number. This is a great iPhone trick for anyone picking up or dropping someone off at an airport, and it’s likely most useful on the iPhone for obvious reasons, but it works the same on iPad and iPod touch as well. Here’s how to use this handy flight info feature. 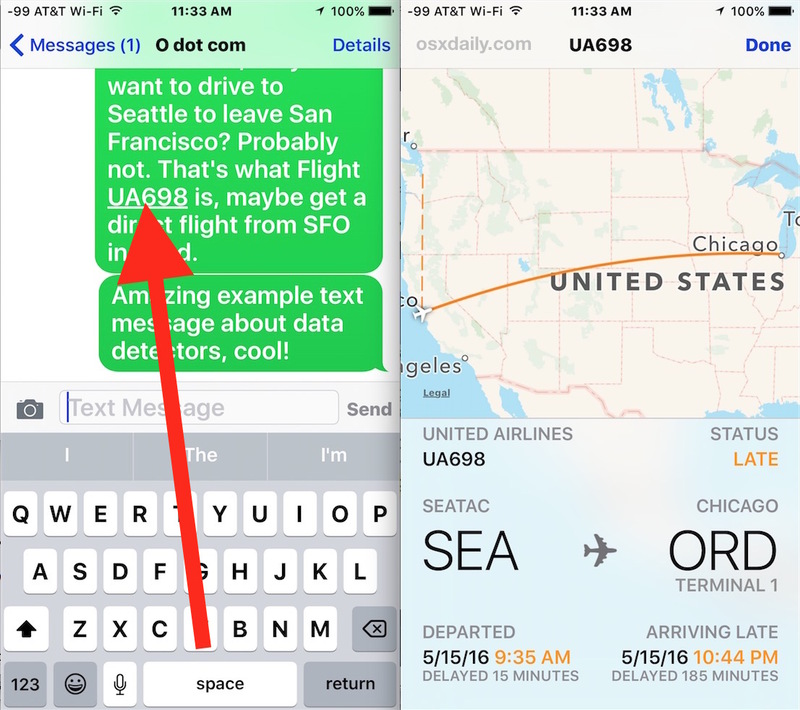 In the example below the flight number is tapped on from an instant message in Messages app. The flight information is practically live, so if you are actively tracking an arrival for someone you can use it to see if they’re on time and when their plane gets in. Users can zoom in and out of the flight map too. For users with a 3D Touch equipped device, the soft press will show the same flight details, and you can then hard press to interact with the flight information if need be. This is obviously for the mobile world with iOS, but desktop and laptop users can use a similar data detector trick to get flight information on the Mac instantly as well. I read there is an app that will tell you what gate your connecting flight leaves from. Is this true? Ask Siri about your flight number? She searches the web. Great AI there, but if you ask Google it gives you detailed info about the flight. I hope Apple improves Siri, it needs major work, it has fallen behind competitors like Amazon and Google. For gate info? You’d have to search the App Store, there are something like 500,000 apps most of which are subpar, it would be impossible to keep track of them all. The dashed line shows it flew from SEA to SFO then to ORD. Is there a way to get this information directly without needing to first get the flight number from a message? You can click on the flight number in an email too. I do this when I fly, like when you get a confirmation about your flight, tap on the flight number and it comes up. Useful. Too bad this is only for domestic flights. It does not work with Alaska Air flights. In fact I cannot get it to work with Delta either. Pretty useless. 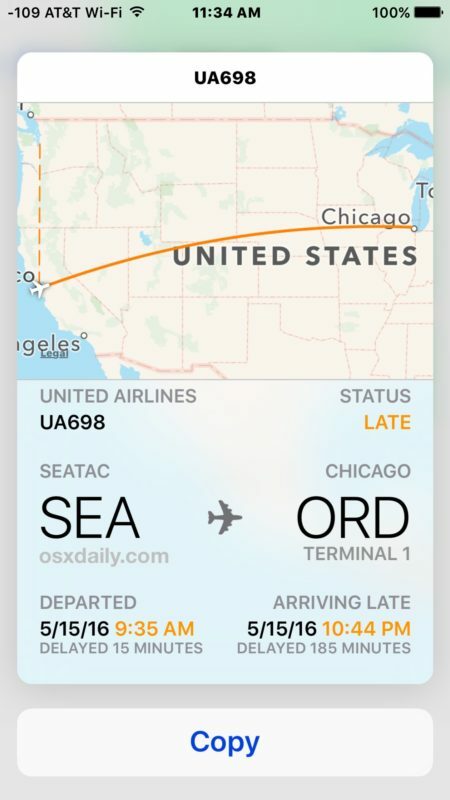 It’s a feature of iOS, it works with every airline with a flight number that is part of FAA, especially in the USA, CA, and western EU. It does work with Delta I was on partner flight. It works here in Paris with an international Air France flight. Just to let you know that the information on the airport may not be correct. I checked my flight from Singapore to Bangkok, it reflected the wrong airport in Bangkok being Don Mueang and not Suvarnabhumi for a flight by Singapore Airlines. To get it to work in iOS Messages app you have to put the word “flight” followed by a space in front of the flight number. ie “I’m on AS308 to SFO” didn’t work for me, but “I’m on Alaska Airlines flight AS308 to SFO” did work. My husband is not registered user with Delta App or Website; he simply opens the app, enters the flight number, and selects to receive notifications. The app shows Terminal, Gate, Gate Changes, and other details. It is easily seen in the Notification Center. The app texts or emails your status updates in addition to the App Notification Feature. This information is available for flights he has booked a month in advance. I hope this helps!